While on the road, Tutubi has difficulty of sleeping and prefers to stay awake and stare at the window always on the lookout for a new discovery, however trivial, for it's always along the way that serendipity strikes or a moment to be seen may be missed. 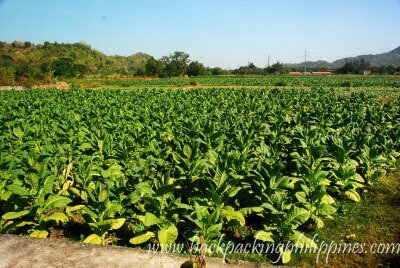 While slowly traversing a narrow road from Santiago Cove, he noticed patches of vegetables that turned out to be, on closer inspection, tobacco plants, interspersed with corn fields. It's the first time he noticed them up close, hectares and hectares of them planted with the addicting plant made into cigars and cigarettes. Trivia: Tutubi doesn't smoke, he didn't even try to puff a stick of cigarette in his life. He only knew how to light one when requested by father to light one for him when he was a child. Noone among his 4 brothers and 2 sisters smoke; good thing his father quit the vice a few years ago. Oh yes same feeling I had when we were in Ilocos. Can't sleep kahit pagod from the long travel because of too much anticipation for the next days. I used to be a pack a day cigarette smoker but one day I decided to quit "cold turkey" and I have not smoke a stick since. I feel liberated! come to think of it, what happens if the world universally outlaws tobacco ? Lots of people will lose their livelihood and giants like Philip Morris will go bankrupt ! you can sleep when you get home, that's my opinion. kaya ako din naka dikit pisngi ko sa salamin ng sasakyan at panay click ng shutter. nakikita ko yan pag nagbabakasyon ako sa Ilocos Sur... pati yung nag naghaharvest sila... ang saya!!! ang daming yosi!!! hahaha!!! bertN, congratulations, you turnd off the switch. not an easy thing to do for most people. 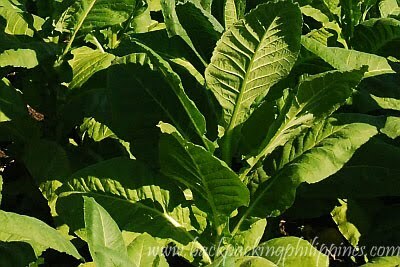 Tobacco plants, scattered with corn fields. It's the first occasion when he saw them very close, hectares and hectares of them planted with the irresistible plant made vape wholesaler into cigars and cigarettes.